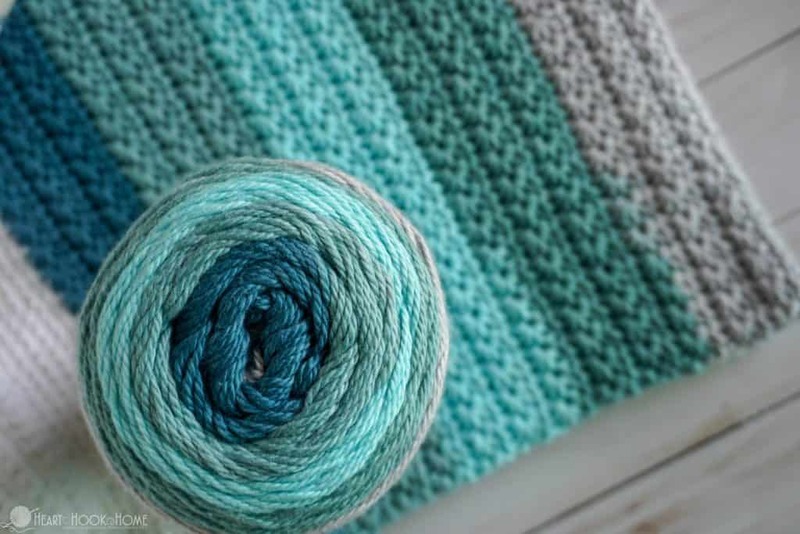 If you love a thin, soft cotton yarn for crocheting and knitting, you’ll love cotton cake yarn! From the big box stores we have two options: there are Caron Cotton Cakes and then Hobby Lobby has their NEW Sugarwheel Cotton Cakes. You’ll love both, I promise! Read on for all of the details on each. 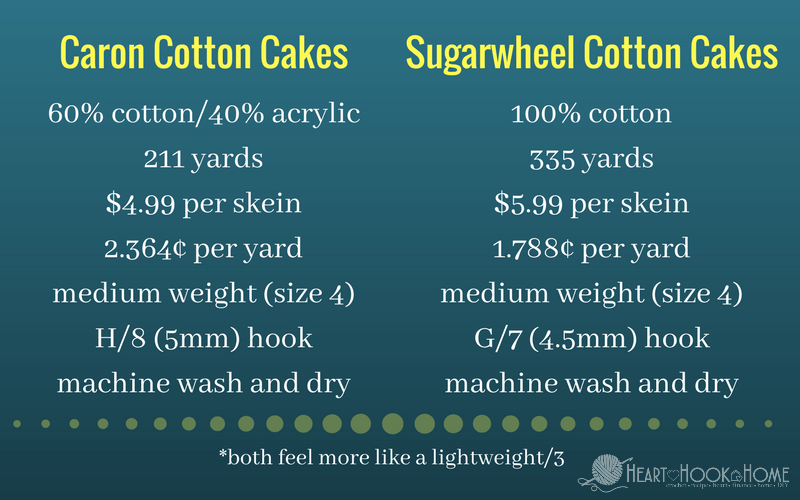 So let’s take a look at the two widely available versions of cotton cakes: the Caron Cotton Cakes and the Sugarwheel cotton cakes. Caron Cotton Cakes are sold at Michael’s stores and online. Note that while they were available in-store last summer (as in summer, 2017) I have not yet seen them this year at my local stores. You can definitely order them online though! 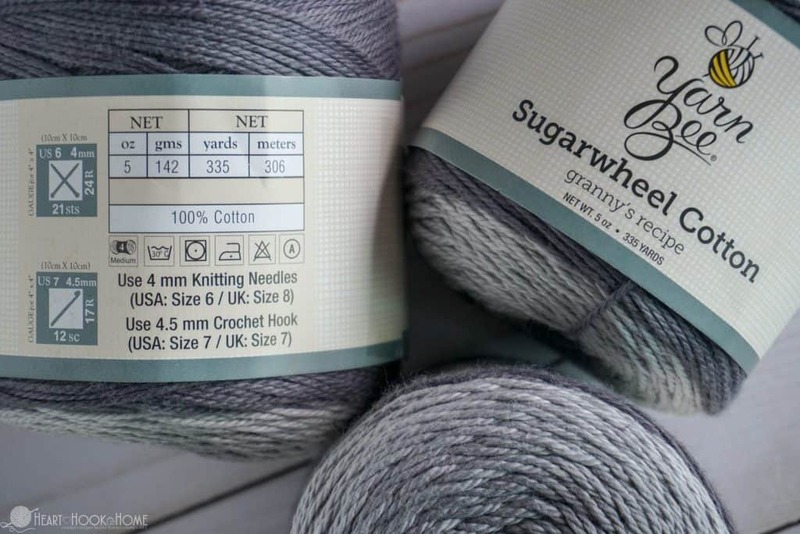 Caron cotton cakes contain 211 yards of a lovely cotton blend. Yes, these are a BLEND, meaning that they are not 100% cotton. Something to definitely take note of if you will be using this yarn in the kitchen. Acrylic melts so you’ll not want to use this yarn for anything like a hot pad, oven mitt, etc. They come in a variety of no less than TWELVE colors, and they are all gorgeous. I do find these colors to be a bit more muted than the Sugarwheels below. The I Love This Cotton! 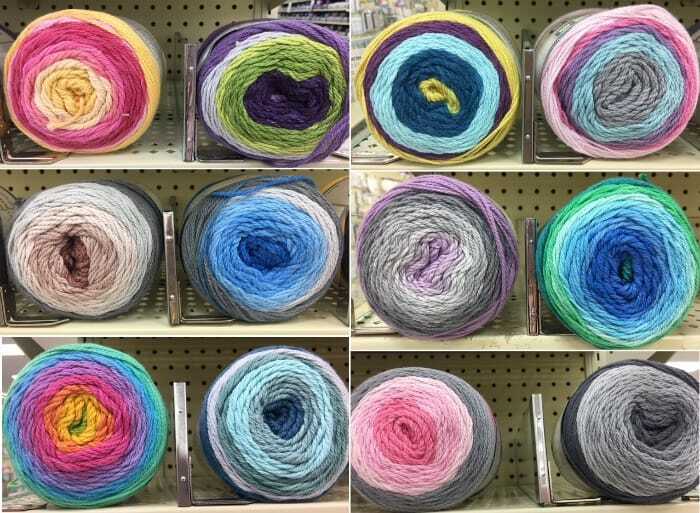 yarn, also from Hobby Lobby, has the exact same make-up, except the regular cotton is 4 ply and available in solid or variegated colors whereas the new cotton cakes are 3 ply and multi-color like the worsted weight Sugarwheels. If you’ve used that cotton before, you’ll know how soft it is; luxurious really. They come in a variety of TWELVE color options that speak directly to my soul. 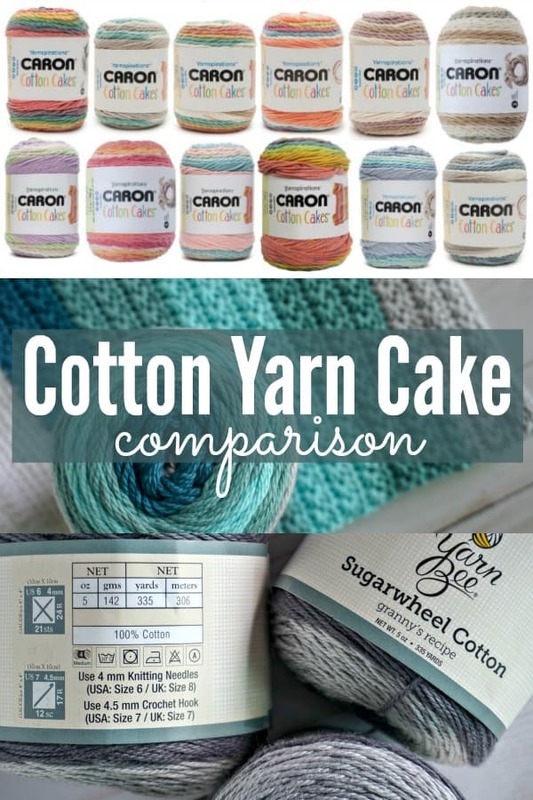 I personally prefer the Sugarwheel Cotton Cakes over the Caron Cotton Cakes as they are softer, a better value, and the color options are more to my liking. Of course, it may depend on the project and the availability of each. 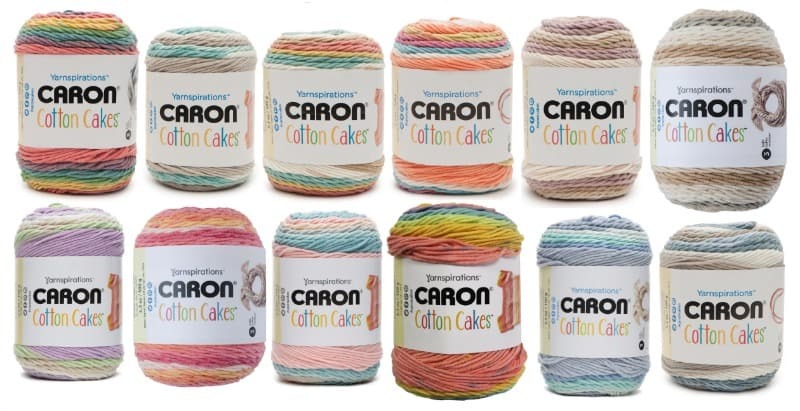 Speaking of availability, neither the Caron Cotton Cakes OR the Sugarwheels are available at my local stores just yet. 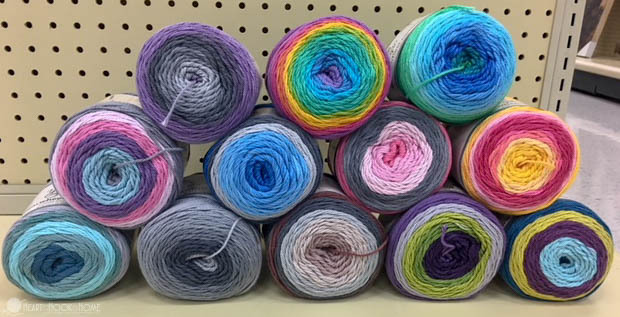 While they should be hitting shelves any day now, you may want to call ahead to make sure that your store does, in fact, have these beauties in stock before you pack up to go pet the yarn. Come to me, my pretties!! Ha! Which of these do you like better? I can’t WAIT to create with them! Hallo! I wonder if it is posible to by the yarn from you, because the yarn is not aviable her in Sweden. How mutch will the yarn plus shipping cost? Definitely the HL version for me. I like Caron yarns but I am a cotton yarn addict - and I get very excited when I see the thinner cotton. So hard to find in the states or at least in the variety of colors I would like. And I have been wanting to try these multicolored cakes and have never done it because so many of them are acrylic which I really do not like. I can't wait to check my HL in Lake City. Thank you. I have been using it all summer and love it. It is so soft it's like a hug in a roll. I'm definitely looking forward to finding the Sugarwheel Cotton Cakes at my Hobby Lobby. Thank you so much for the side-by-side comparison. And your bag pattern looks lovely... I can't wait until you release that pattern! Any idea when we can be treated to that? I cant find the cotton sugarwheels on HL website... only acrylic ones. Do you have a link to these? Hi Tracy! They have not yet added them that I can see. Hopefully very soon! I'll update with a link when they become available. Yay! Correction, the Sugarwheels are $6.99. I believe the worsted weight ones are, yes.